George Graham Reviews Karan Casey's "Ships in the Forest"
The Celtic music scene continues unabated after its revival of popularity back in the 1980s. And one of the artists who emerged as part of the scene in the 1990s is vocalist Karan Casey, who was the founding lead singer with the group Solas, one of the innovative young bands in the genre. Ms. Casey left Solas amicably to raise a family and maintain a solo career at a somewhat slower pace, but that has not stopped her from releasing a series of fine solo albums, starting in 2001 with The Winds Begin to Sing. Now she is out with her fifth solo recording, which she describes has being her most ambitious, called Ships in the Forest. Calling it "most ambitious" might be a bit surprising at first to the casual listener, since the album features very spare instrumentation, and ostensibly simple arrangements. The material largely consists of traditional songs -- some quite familiar. But the 39-year-old Ms. Casey says "It has taken all my years as a singer to come to the point of feeling confident enough to tackle the big songs within the traditional repertoire." And she provides distinctive treatments with superb, subtle vocal performances, with the accompaniment putting an even greater focus on her singing. The result is a memorable, often plaintive-sounding album that is largely melancholy in mood. In fact, this is quite a bunch of sad songs, several of which are about war, and its losses, along with downright tragic love songs, and a song about the hardships the Irish endured in their emigration to America during the famine of the 19th Century. The material also includes Robert Burns and Joni Mitchell, along with a new contemporary song that sounds a couple of hundred years old. As the great English folk artist June Tabor has been doing, Karan Casey performs the many of the songs with piano accompaniment, rather than guitar or other so-called "folk" instruments. To be sure there are bagpipes and guitars, but for a Celtic album, the dominance by the piano is unconventional. The recording was made in Ms. Casey's home in Ireland, with Caoimhin Vallely on the piano, along with Kate Ellis on cello, another prominent and unconventional instrument, Robbie Overson and Kris Drever on guitars, among others. Ms. Casey is credited with at least co-arranging the traditional material on the album. 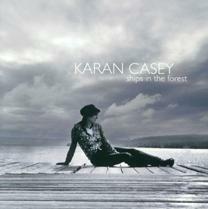 For such a beautiful-sounding album, Karan Casey's new CD Ships in the Forest is a collection of really sad songs, ranging from love lost to wars, tragedies and massacres. Of course, that is the stuff of old folk songs, and that was her aim, in plunging into the traditional material on this album. And with the stark, spare accompaniment, the songs are in a way, made more powerful by Ms. Casey's superb performances: poignant, but never maudlin, achieving their impact through understatement, and irony through the beauty of the music. Our grade for sound quality is a one of our relatively rare "A's." Ms. Casey's vocals are nicely recorded, with a good balance between intimacy and atmosphere. The dynamic range is also decent, by contemporary standards. This may or may not be the kind of album to play when you're feeling blue. The lyrics can bring a tear to the eye, but at the same time, one can't help but derive great pleasure from these memorable performances by one of the great voices in contemporary Celtic music.